The world is decimated by a virus infection that has turned most of the population into zombies. The virus was created by the Umbrella Corporation who is seeking Alice, the only known test subject that had the ability to bond with the T-Virus and which has also given her super human powers. In this 4th in the series based on a video game, we find Alice searching for survivors in Arcadia,Alaska based on a broadcast of message offering hope and freedom from the virus. In the last episodes of the series clones of Alice (Milla Jovovich)were created by the Umbrella Corporation to help study the virus. The Corporation headquarters have gone underground away from the hoards of hungry zombies on the streets. One of their massive subterranean labs in Japan is attacked by Alice clones in a balletic slo-mo fight sequence with guns, knives and flying ninja stars. The only one to survive is Umbrella chairman Albert Wesker (Shawn Roberts) who blows the facility to smithereens. Wesker also possesses superhuman strength, speed, and regenerative capabilities. The real Alice has stowed away on his escape plane and he overcomes her by injecting her with something and she thanks him for making her human again before the plane crashes. A few months later Alice is flying in Alaska seeking Arcadia from the emergency broadcasts. Alice finds a field full of planes, obviously from other people who were attracted by the emergency beacon, but the place is void of human habitation. Suddenly she is attacked by Claire (Ali Larter) one of the survivors who encountered Alice in the previous film. She has this weird mechanical bug attached to her chest and she doesn't remember anything. After removing the device Alice takes her on the plane while they search for more humans. They team with a group holed up at a correction facility that is keeping out the thousands of zombies surrounding the compound. They think Alice is there to rescue them as they see a ship off shore called the Arcadia and assume it must be the safety they seek. Alice's plane only carries 2 people, so they must find another way to get to the ship. Time is short as the zombies have found a way to get in from the sewers and a big giant zombie somehow has the ability to weird a massive hammer to break down the gates. This is a nod to video game Resident Evil 5 where he's called “The Executioner”. Paul W.S. 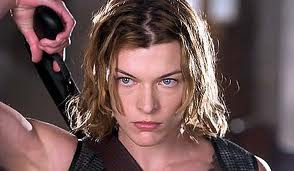 Anderson who has a resume of video game type movies, teams up with Jovovich again as director and writer. It helps to have seen the other parts of the series to understand why Alice is seeking revenge on Albert Wesker, why there were Alice clones, and what's up with the superpowers and the zombies. The non stop pace and action shots are especially enhanced with Cameron's 3D Fusion Camera System. Visually it's quite appealing with it's stark contrasts and doesn't give you headaches with shaky cam shots. Zombie attacks and battles are gross and well done by stoic Alice who is singular in her mindset to survive and conquer. We are talking inventive zombie kill shots. Wentworth Miller shows up as Chris Redfield, Claire's brother who everyone thinks is a convict (type casting?). The other characters fill out the red uniform crew who are basically zombie fodder until the climatic ending, which of course leaves it opens for the next movie.